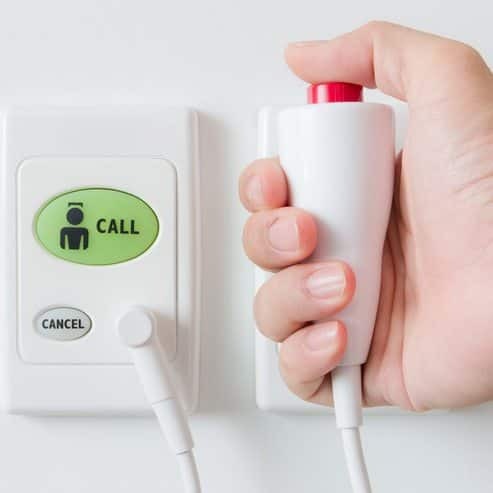 Nurse Call Systems are a button or a cord that is found around hospital beds, private homes, medical clinics, residential care homes and toilets or bathrooms. It allows vulnerable people to alert a nurse or a health care member of staff when required. Oakpark are able to offer both wireless and wired nurse call systems, depending on your specific needs and the facilities in which the Nurse Call system is required. We often think of the need for Nurse Call Systems being needed in situations such as a medical emergency, for instance a fall or faint. However, Nurse Call may also be imperative in external life-threatening situations such as a fire. The potential risk involved in such situations will be greatly decreased with the use of a Nurse Call, as a healthcare professional will be notified immediately increasing effectiveness and efficiency in response time. Having an immediate response by the appropriate health staff is crucial as seconds save lives. Nurse calls are highly cost effective, as it is improving safety and streamlining a nurse’s workload, making them more efficient. Get in touch with our expert fire safety team today to find out more.